After almost two full sea days on our Caribbean cruise, we were ready for a port. Don’t get me wrong; sea days can be relaxing…but we were ready to see some sights! Despite the hurricanes, one thing that did not change on our itinerary was the port stop of San Juan, Puerto Rico. By the time we visited on December 11, 2017, Old San Juan was looking tidy and clean. There were, of course, the hum of generators and some rebuilding going on, but Old San Juan was ready for tourists. It’s the outlying areas that need more help and investment. In Old San Juan, we found friendly people, beautiful buildings, and great weather. As we approached San Juan, we headed out onto the upper decks of the ship to get a primo view as we sailed past the landmark fort of El Morro. We docked at cruise pier for Old San Juan at 3:30pm and were off the ship before 4pm. Because of the short time in port, we opted to do Old San Juan on our own. Being winter, the sun sets at around 5:30pm, leaving us with about 2 hours of daylight after docking. So we decided to hightail it over to El Morro to see the historic fortress. 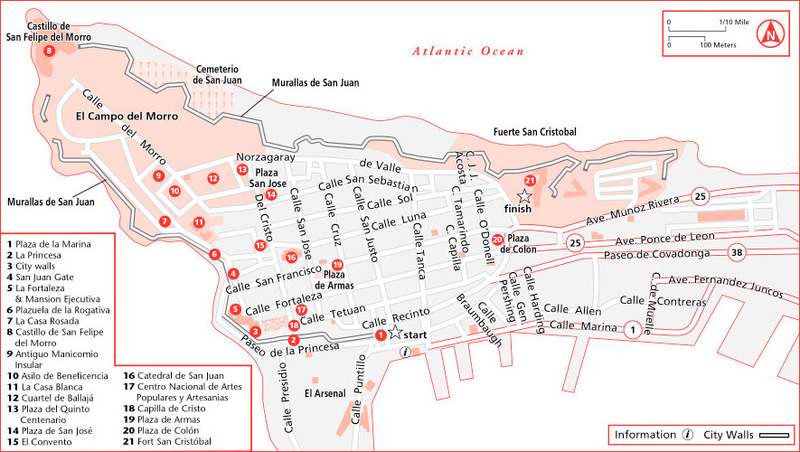 Old San Juan wasn’t particularly busy, owing to devastating hurricane. We could go a couple blocks on a Monday afternoon and encounter few people. Most places had power, although a few were running on generators. We made our way through the colorful streets of Old San Juan to El Morro. It’s about a 30-minute walk. You can also take the free Old San Juan Trolley. It wasn’t running due to hurricane recovery when we visited, but hopefully service will commence again soon. The San Juan National Historic Sites had just reopened after hurricane damage on December 2, 2017. Prior to that, you could only walk the exterior grounds. Having limited daylight, we had to choose between Castillo San Felipe del Morro (El Morro) or Castillo San Cristobal. We went with El Morro since you sail past it coming into San Juan. We were not disappointed. Admission is $7 per person (at time of writing) and you can use your ticket to also gain entry to San Cristobal. This time of year, the sites close at 6pm. We spent time wandering the grounds, exploring darkened stairways, and taking in the vistas from the turrets – an icon of San Juan. Owing to the lack of tourists, there were times where we felt like we had the fort to ourselves! We stopped in at the San Juan Cathedral, burial place of Ponce de Leon. After church, it was time to drink. Just kidding. Well, maybe not. We walked around Old San Juan some more and did a little souvenir shopping. I have to get travel magnets wherever I go. You should see our refrigerator–it would surely win a tackiest refrigerator contest! We also stopped in at a store that made wooden Puerto-Rican style “door” decorations with your names painted on them. We got a couple for Christmas gifts for back home. Then we spotted a historical marker for the pina colada! We had to stop here. The restaurant is Barrachina on Calle Fortaleza. And yes, we had pina coladas! They were good. We’re were also hungry. We each ordered the mofongo, a Puerto Rican speciality. Delicious! Fully satiated, it was now dark. We wandered down Paseo de la Princesa to the water’s edge and then walked back to the dock to get back on the ship. I know Puerto Rico is still going through hard times there, but we absolutely LOVED Old San Juan. People were extraordinarily friendly and welcoming. Down the road, I think I’d like to take a cruise based out of San Juan so we could explore it a little more. ← Celebrity Equinox to the Caribbean!